The collectibles industry has evolved quite a bit since you last remember it, and a big part of that evolution is the importance of premiere retail stores. These are places with serious, dedicated owners who facilitate a community environment for their customers, and beyond that, create a really fun environment to hang out. Every month right here on the blog, Upper Deck will spotlight one of our hobby retailing partners, and some reasons why you need to visit their store. Today, we’re starting with a great store in the Dallas area. Monday – Friday 11:00am-7:00pm, Saturday 10:00am-6:00pm, and Sunday 12:00pm-5:00pm. Nick started collecting baseball cards when he was a boy in the late 50’s in Oklahoma. He went to his small town grocery store and bought packs of cards for a dime. After graduating from college, he pulled his collection out of shoe boxes and continued his collection. 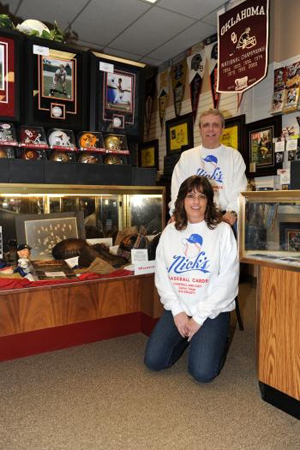 In late 1986, he and his wife Debbie went to their first card show, and their love for the hobby took over. Nick and Debbie started setting up at shows and after a year of success with that, they moved to Dallas and opened their store just two weeks after arriving. 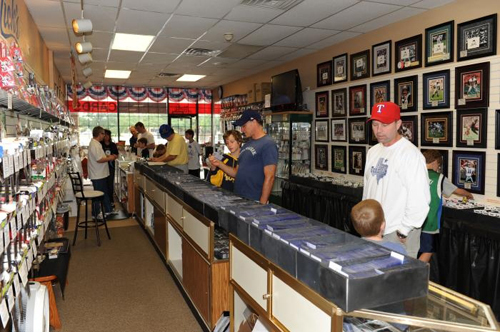 They have been in the same location since July 15, 1989 and are the only remaining sports card store in Dallas. They are a family owned and operated store with a warm atmosphere and shelves stocked with product at reasonable prices. • An entire area dedicated to vintage cards for those looking to complete older sets or just check out some of the cards that started it all. • They carry all the latest trading card releases in all sports. • 50 cent bargain boxes loaded with cards of players from every sport. • A program for kids to receive free cards for good getting good grades. • Big pulls are highlighted on their website. • Nick built a “Pre-Owned Cardboard” section with affordable vintage cards. • Free sports card grab bags for kids on their first visit. • A room stocked with sodas and snacks, as well as comfortable chairs and a table to open boxes of cards. • A 45″ big screen television tuned to all the big games and sports news. Nick’s has some amazing items on display in the store including a Babe Ruth autographed baseball from Nick’s personal collection. 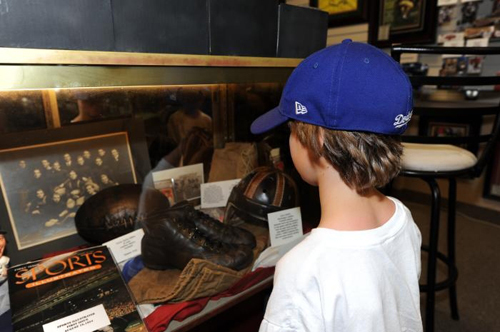 They also have section that is almost like a sports museum with unique items such as old melon footballs, dog-eared helmets, uniforms and one of the first catchers masks in baseball. So a visit to Nick’s comes with a bit of a history tour as well. For every $10.00 spent, customers are eligible to win a $25 and $50 gift certificates each week on Fridays. Every six months, the “Nick’s Gives Back” drawing gives customers the opportunity to win amazing autograph jerseys from players like Kobe Bryant, LeBron James, Larry Bird, Adrian Peterson, Troy Aikman and more. 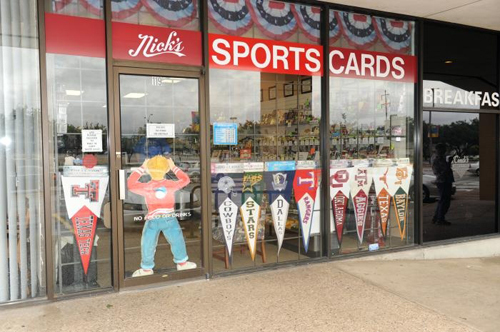 Nick’s has been called the “Cheers” of sports card stores by their customers because it has a small town atmosphere in one of America’s biggest cities. Nick and Debbie are all about providing you with a great customer experience, and have created an environment that brings back customers of all ages. If you live in the Dallas area or are planning to visit, check out their website at www.nickscards.net. They are open seven days a week! I was in Dallas area last week, wish I had known about Nick’s then, I would have loved to have visited. I will try to check it out in August when I am back out there. Nick’s is the only card store for me. I have been a loyal and happy customer since 1989. It is rather interesting for me to read this article. Thank author for it. I like such topics and anything connected to them. I definitely want to read more soon. BTW, rather nice design you have at this blog, but what do you think about changing it every few months? Great Couple and store. They sold recently to another great guy. Hope it is around for years to come!